I mean, who wouldn't love the gift of ice cream?!? (Other than those who are lactose intolerant or have a dairy allergy, of course! Sorry, friends. We have one child who is gluten-free, so I know how difficult that can be!) Think about it... Exhausted mom friend who juggles it all? Ice cream. Frazzled teacher who deals with 20+ kids for 7 hours each day? Ice cream. Bus driver who has to deal with a bus full of loud children? Ice cream. Party hostess (or host) who just worked hard to set up a holiday celebration? Ice cream. Sometimes ice cream really IS the answer. Toss in a few bowls, spoons and an ice cream scoop, and the lucky recipient can indulge on the spot. The exhausted mom can eat a few spoonfuls in the carpool line. That frazzled teacher can sneak in a few bites at her desk. The bus driver can dig in after the last kid gets off the bus. And that hard-working party hostess can kick up her feet after the party and enjoy a treat of her own! 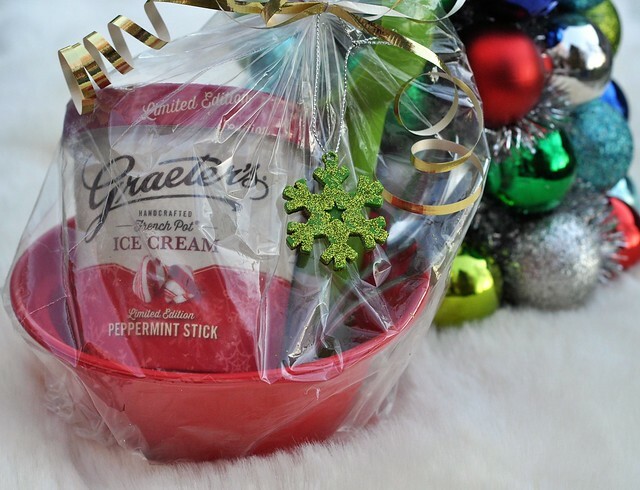 Giving the gift of ice cream is even easier than ever before, thanks to Graeter's! 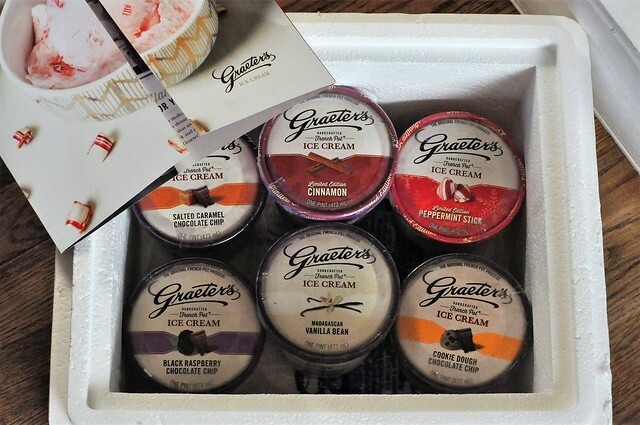 Graeter's is a family owned and operated company, which was founded in 1870. They make their ice cream the old fashioned way, using the French Pot Process. Because the ice cream is so thick, each pint is hand packed! 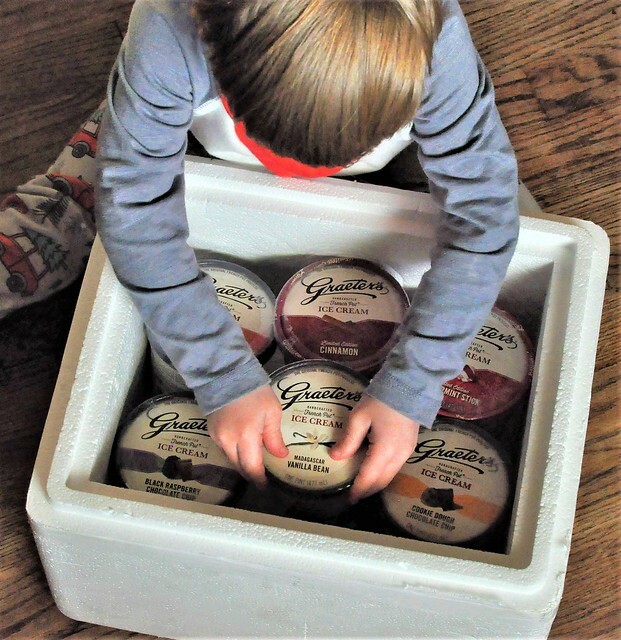 Graeter's offers custom gift boxes of their delicious ice cream pints that can be ordered online and shipped directly to your home! Ice cream delivery? Yes, please! 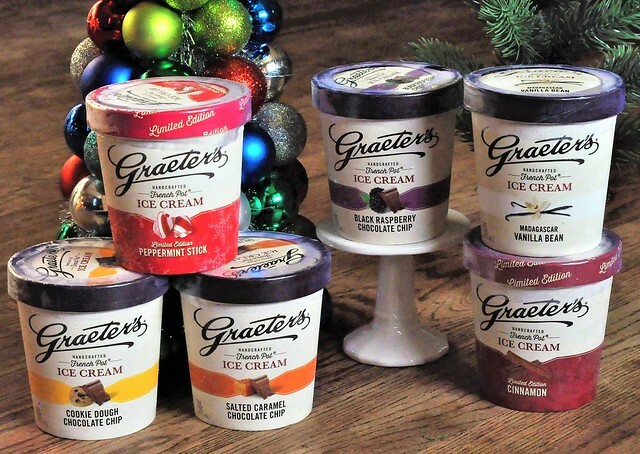 With flavors like black raspberry chocolate chip, eggnog, peppermint stick, vienna coffee, and salted caramel, Graeter's is sure to be an instant hit! You can order it as a holiday gift, or even have it delivered to your home or office for a party. That's minimal work for you, which is automatically a win! Besides, finding a cooler of ice cream on your doorstep is fun treat! 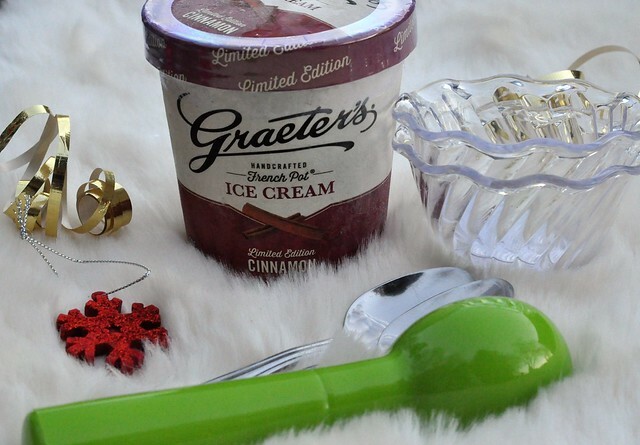 With just a few added (inexpensive) items, the gift of ice cream becomes an extra sweet gift! 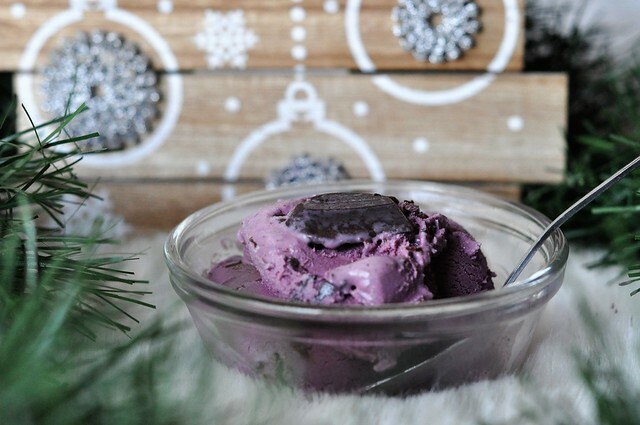 I put together two Ice Cream Holiday Gift Bundles for two special people in my life. One is for a mom who has young kids and the other is for a person who doesn't have any kids. There is a difference...trust me! The mom gets the plastic bowls, and the person without kids gets the glass dishes! *Cost of all additional supplies was under $20 for multiple gifts! 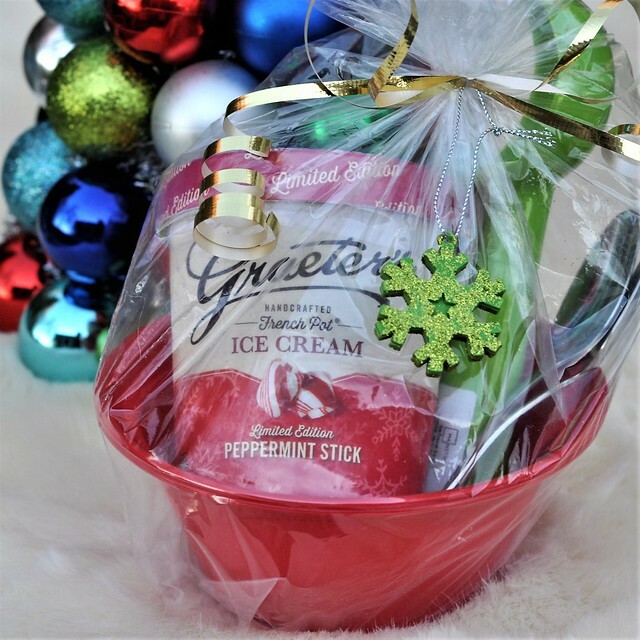 This ice cream gift bundle is perfect for all the moms in your life! The plastic bowls are practical, JUST in case she wants to share her ice cream with her kids! The ornament tied to the bag gives it the perfect finishing touch! 1. Stack 2 plastic bowls together. 2. Place the pint of ice cream in the bowls. 3. Put the ice cream scoop and 2 spoons into the bowls. 4. Place the bowls in a bread bag, then tie it up with the curling ribbon. 5. Before tying the bow, thread the ornament onto the ribbon. 6. Tie the bow and curl the ends of the ribbon with scissors. 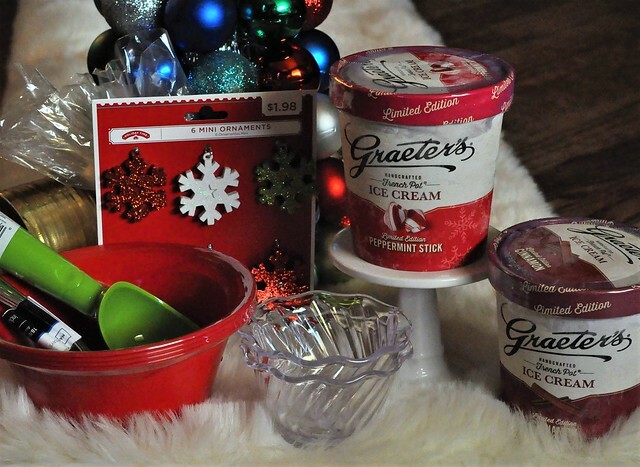 This ice cream gift bundle is perfect for the person who doesn't have to worry about little hands breaking things! It's just a tiny bit fancier! 1. Stack 2 glass dishes together. 3. Place the pint and the bowls in the bread bag, then place the ice cream scoop and spoons beside the pint. 4. Gather up the sides and the top of the bag tightly so the utensils don't move around much, and secure with the curling ribbon. 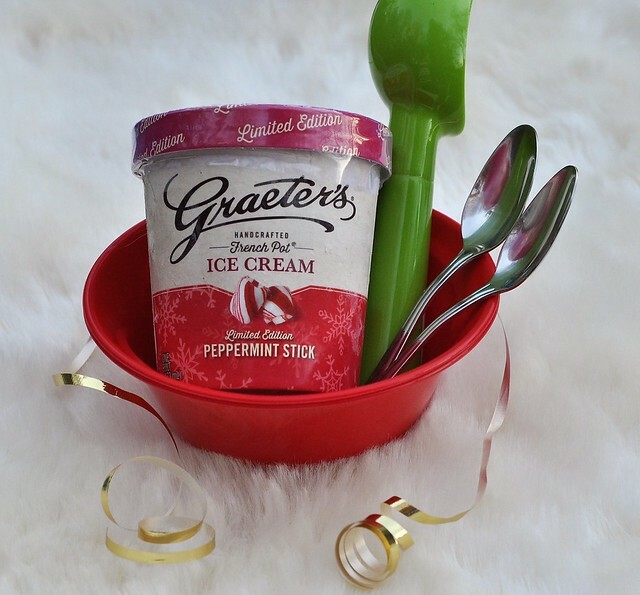 Giving the gift of ice cream is such a simple way to show that you care. 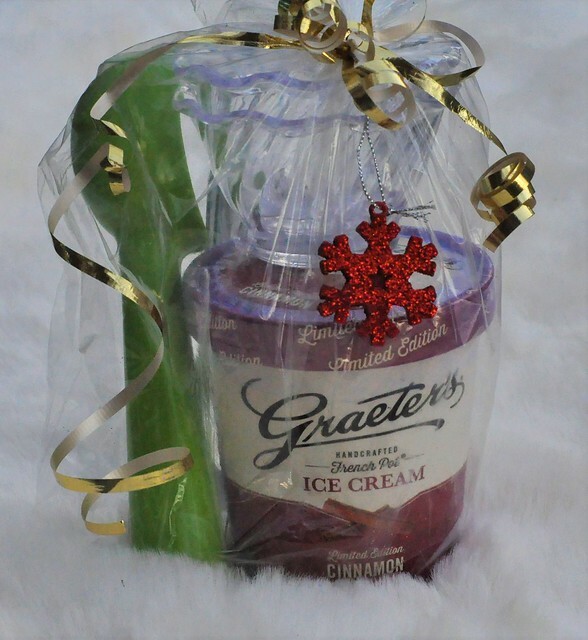 Let Graeter's help you make someone smile this holiday season! To save $5 on your order shipped by December 13th, use the code Too-Sweets at checkout. 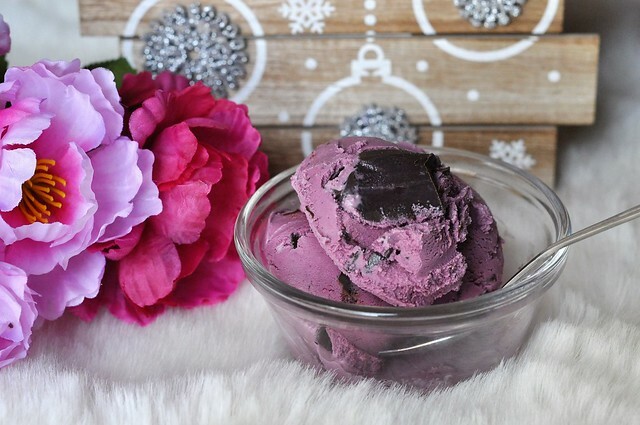 As for me, I just might have saved the pint of Black Raspberry Chocolate Chip for myself. Merry Christmas, me. You successfully made it through another year of chaos and joy! This is SUCH A good idea!! And your amazing, I'm stressing about just four teachers to buy for! We have way too many teachers. Obviously the ones we know well are going to get gifts, but I'm not sure about what to do for the teachers that I never met. Junior High is a big change for us! I would adore getting this as a gift! YUM!! Right?!? It's really good ice cream, too! Such a cute idea!!! Who doesn't love ice cream!?! I love it, that's for sure! These are so cute! So how do you keep the ice cream from melting? We gave one set as a hostess gift, and she put it directly in the freezer. I plan on delivering the teacher's gifts to the school and having them placed in their lunchroom freezer. Liam's teachers have a freezer in the adjacent room, so they're set! I love love love love love Graeters ice cream. It's my favorite local chain and I am so excited that you can now have it delivered to your door. It was so good! I just discovered that we have a store just 15 minutes away...it's the only one in the Pittsburgh area! What a "sweet" idea! You've made my hero list again. I can't imagine buying for so many people, yet, you're teaching your children about giving from the heart. (I would love this special ice cream bundle.) So thoughtful! Thank you! I always buy for the teachers, therapists and the bus driver. I feel like it's important to acknowledge how thankful we are for all their hard work with our kids!